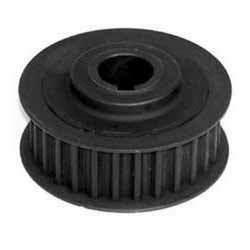 At CAPITAL various types of Spindle Pulley designs are available . Each pulley is dynamically balanced and crosses from various vibration analysis. The Power is transferred between the shafts by means of endless belts running over these pulleys. Pulleys are used to change the spindle speed and feed rate. With rich industry experience and knowledge, we are committed towards offering an excellent quality range of Spindle Motor Pulley. With the changing demands of our clients, we are offering Spindle Pulley, designed and developed by the experts using advanced technologies and qualitative material. Bore Size: 60mm,70mm,75mm,80mm,85mm,100mm & etc. Ideal Sheet Metal Stampings & Pressings Pvt. Ltd. The steel claded TR pulleys are a unique combination of ABS Glass Fiber Filled Resin and Steel Sheet making them sturdy in operation and light in weight. The steel driving surface is virtually wear resistant. We are enlisted as top company involved in manufacturing, supplying and exporting a wide array of Pulley Spindle. Offered products are highly reliable in nature and are available at reasonable prices. In addition to this, we also assure to deliver our products in a fixed time frame.